Q: What is the CMP Summer Workshop? A: While CMP originated as a planning process for teachers of performing band, choir, and orchestra ensembles, it now includes K-12 general music teachers and studio teachers of any instrument. The workshop includes presentation of the CMP planning model and examples of CMP applied to rehearsals as well as interest sessions related to current issues in music education. Q: What can I expect to learn and experience at the workshop? You will gain an understanding of the CMP Model for Planning Instruction through constructing a teaching plan using music that you would use in your own teaching setting. Participants will attend demonstration rehearsals/classes/lessons led by master teachers from all areas: band, choir, orchestra and levels: K-12, college-university. A shared learning community with enthusiastic and experienced music educators from all areas –in one-on-one and small and large group settings. Special interest sessions exploring a variety of instructional ideas: new strategies, effective outcomes and assessments. A wealth of resources, materials, techniques, and ideas will get you ready for next fall. Q: How do I register for the workshop? A: Visit the 2019 Summer Workshop Info & Registration Page. Registration is now open! Q: Can I earn college credit? A: Absolutely! Completing the workshop will earn you three graduate credits. A: Yes, housing is offered. You will see this option with prices located on the registration form. 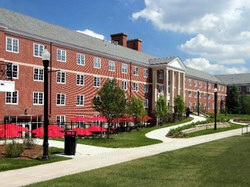 Housing is in the completely renovated Gilbert Hall, directly across the street from the Music Building. Specific information about what to bring in regards to linens, etc will be provided in the workshop information letter sent out a few weeks before the workshop. Please see the 2019 Summer Workshop Info & Registration Page for pricing. Q: I live nearby. Can I commute? A: Certainly! This option is available on the registration form as well. Sessions last until 8:30pm in the evening so please plan accordingly (evening sessions required for graduate credit). It is strongly encouraged that you purchase and use the meal plan that is offered as there is very little extra time built into the schedule. A: Yes, meals are offered through the college food service. Vegetarian, vegan and gluten free options are available at each meal. Meals are offered through Housing. Q: When does the workshop begin and end? A: Registration will begin at 8:00am on Monday, June 17th with the first session beginning at 8:30am. The workshop will conclude at 2pm on Friday, June 21st. Sessions last until 8:30pm in the evening so please plan accordingly (evening sessions required for graduate credit). A: Cancellation can be made before June 1st, with a full refund minus $50 processing fee. After June 1st, no refunds will be offered. A: Instrumental teachers should bring scores of your first choice piece and a good back-up (choral teachers should bring 6 copies of their selected pieces). Good repertoire can make your week at CMP an even richer experience—it is at the heart of what we do all week. Although we will spend quite a bit of time discussing what makes a good piece of music, if you have brought high quality music with you, you will begin the week that much further ahead. When in doubt, bring more pieces—the more music you have with you, the more chance that you’ll find a great piece to study. You will need a laptop computer or tablet device with internet, email, and word processing software. We will share final CMP plans with one another at the end of the week via email, so please be sure you can access your email account via a webmail process. Q: What should I do before the workshop begins to prepare? This book can be purchased from Amazon.com or through WMEA (Wisconsin Music Education Association).